Everyone always wants to make sure they get enough protein. Everyone’s talking about protein. Protein this, protein that. Where do you get your protein? How much protein do you eat? Should I have one protein shake or two? Protein, schmotein! OK, so maybe I’m exaggerating a little. Maybe it’s just 90 per cent of the population that talk about protein, or maybe it’s only 50 percent, or even ten per cent, seriously, it’s probably not even 1 per cent. But there are people out there who count their protein intake. And I’m definitely not one of them. I wouldn’t have a clue how much protein I take in. I don’t know how many carbs, or fat, or calories. What I do know is that when I eat wholesome food I feel amazing and when I eat crap food I feel crap. 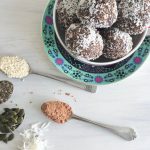 So go ahead make these balls, these nut free protein balls, these protein wonder seed balls without nuts and feel awesome. Feel like superman and don’t feel guilty when that chocolate touches your taste buds. Oh, you won’t? That’s just me? Damn. I often double the recipe as they keep in the fridge for up to two weeks in an air-tight container. Theoretically they can last two weeks, realistically much less. 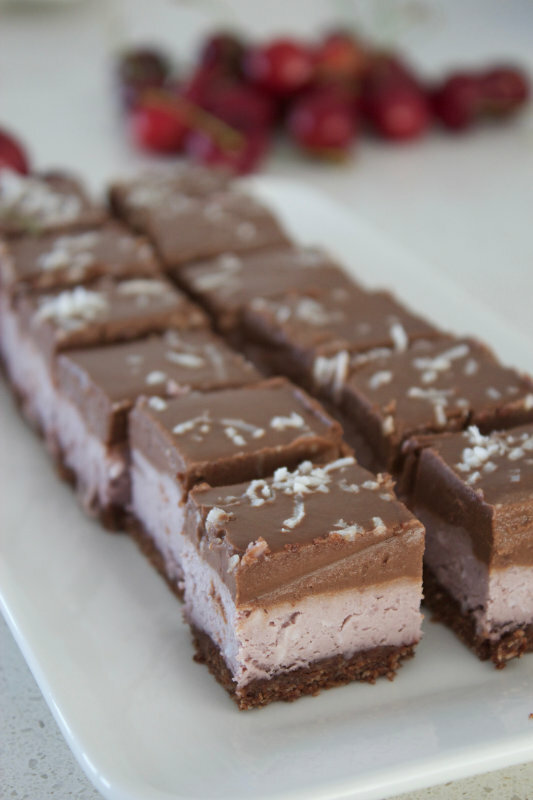 Want more nut free recipes? Try these nut free muesli bars. Looking for hemp seeds? They are becoming more widely available now that Australia has changed the law around selling hemp seeds. I get mine from Aussie Health Foods. If you make these share a photo of them, I’d love to see. I’ve already seen the cutest photo of my friend’s little boy who doesn’t like to try much, but he loved these! Place the hemp seeds, sesame seeds, chia seeds and peptise into a food processor and process into small pieces. Add the coconut, cacao, drained dates and maple syrup and blend until the combined, about 30 seconds. Wet your hands, roll the mixture into balls and roll in coconut. It pains me to have to be the one to deliver the news to you, but coconuts are nuts! 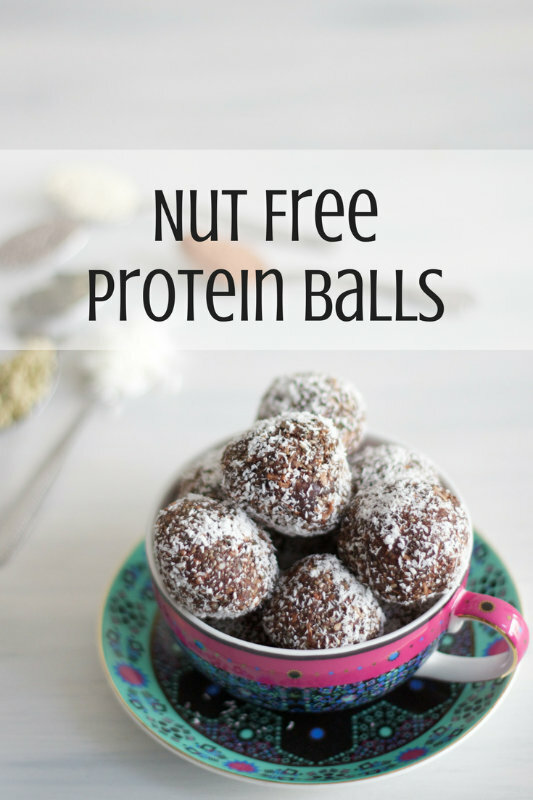 Which inherently means, my dear, these balls are not in fact, nut free. Wish I could taste your nut free balls but alas, coconuts are nuts too. #metoo #allnutsmatter #areyounuts??? However, I’m guessing from your comments that you do have a nut/coconut allergy and hence these nut free balls are not suitable for you. 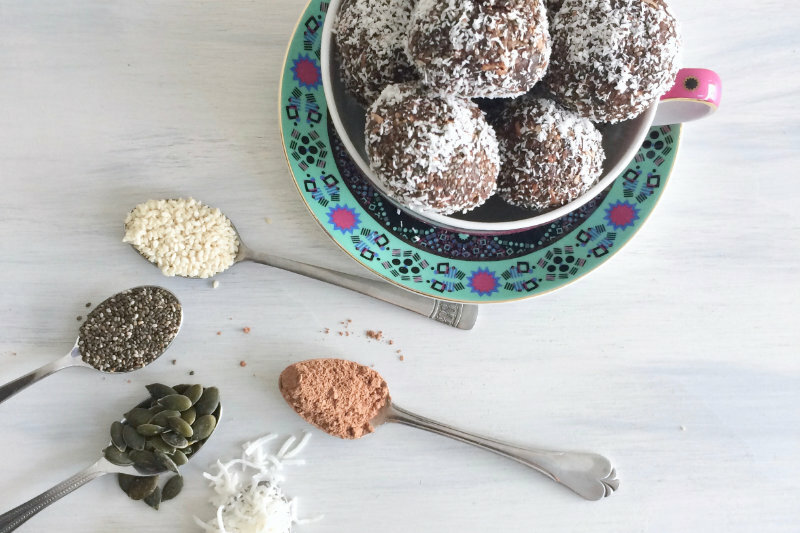 You can simply leave out the coconut – both in the ball and for the rolling. 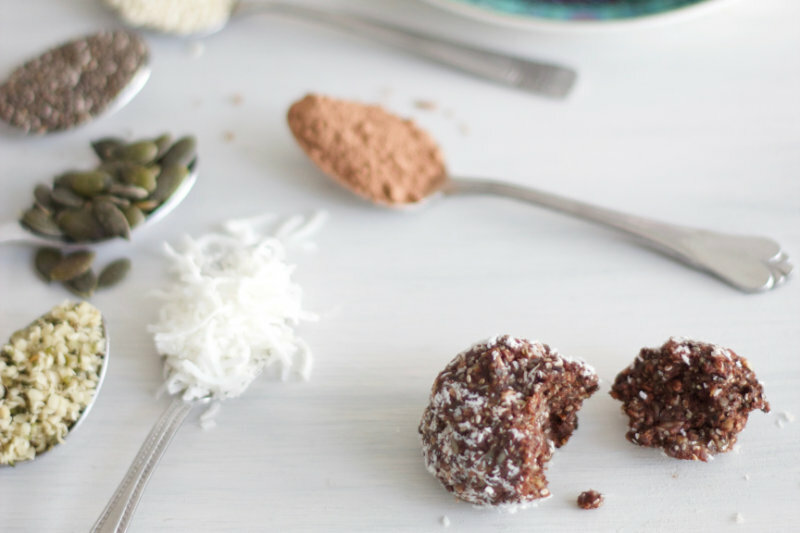 You could try rolling the balls in cacao or sesame seeds.